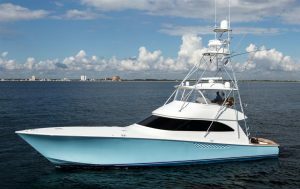 Check out this beautiful used 66' Viking yacht for sale in Florida! : Atlantic Yacht & Ship, Inc. Check out this beautiful used 66′ Viking yacht for sale in Florida! Come see this stunning used 66′ Viking yacht that Chris Carroll has for sale and ready to go! In the first place, this beautiful used 66′ Viking is known as “Insane-O”. Of course, she offers many of the latest and greatest upgrades and features. In fact, the saloon features a day head aft for convenience when fishing. The layout includes three main cabins with heads a fourth crew cabin. Equally, each stateroom has access to it’s own private head. These are just highlights of all this yacht has to offer! As can be seen, this bridge on this used 66′ Viking has an island helm console with abundant electronics. Additionally, there are three helm chairs so guests can enjoy the experience alongside the captain. The sleek lines of the hull give her a custom boat appearance. The current owner has kept this boat in perfect “Palm Beach” condition and all systems are go! For more information on this used 66′ Viking yacht be sure to contact Chris Carroll today!